There are ‘Hacktivists’, who use computers and networks subversively to advance political agendas. And ‘Slacktivists’: Hacktivist wannabes who just go for feel-good measures in support of social causes. Zodiactivist – a follower of astrology opposed to the proposed addition of that pesky new 13th sign. Tarmactivist – a passenger-rights advocate seeking to have the boards of directors of airports causing boarded passengers to wait longer than one hour on the ground be chained to runway aprons for an equivalent time. Plus double airline miles. Facticivist – an existentialist who feels mankind’s fundamental angst begs for repudiation of all things determinist, but protests the fatalists knowing that’s what he thought. Or was going to, anyway. Packtivist – people who believe that one should be able to carry a registered handgun anywhere: in a waistband, or a fanny-pack. Under one’s hat. In one’s lingerie or boxer shorts. But not jockeys. Lilactivist – one who opposes the new re-blooming lilac hybrids, which flower repeatedly from early spring through Halloween. Lactivist – invites all to join in opposing any protest of breastfeeding in public places. If you’re mom enough. KitKativist – one who seeks to have the ‘four finger’ shape of this beloved snack ruled in the public domain and out of reach of the continued efforts of Nestle Corp. to trademark it. Deepakavist – one who promotes a fund to surgically remove the rhinestones on the horn-rimmed glasses of this celebrity author and spiritualist. Cul-de-Sactivist – an urban planner advocating residential streets be reconstructed to end in circles, known to promote social adhesion. And breastfeeding. CrackerJacktivist – fighting to restore a decent peanut-count and real toy prizes, along with the legacy cardboard box packaging to this legendary snack, thus halting the long, slow slide of western civilization into the abyss of soulless commoditization. Cracktivist – lobbies for reducing the sentencing minimums for possession of crack, which has been classified with a criminal equivalence to cocaine, though it’s a fraction of the strength. Cognactavist – seeks contribution of a percentage of bottle service upcharges for this liqueur at fine restaurants and clubs to fund research on distillation and aging. On Mars. Caddyshacktivist – animal rights apostles seeking elimination of inhumane control techniques, like flooding, fumigants and trapping, as well as any showings of the original movie for promoting violence towards burrowing animals. Cadillactivists – direct descendants of the Apache chief Geronimo, who seek remuneration for his ‘endorsement’ of the brand in 1905, though the car he was photographed in was actually a Locomobile. Blisterpactivist – lobbies to end product packaging that incites ‘wrap rage’, the anger and frustration many feel when trying to open ‘clamshell’ style containers. 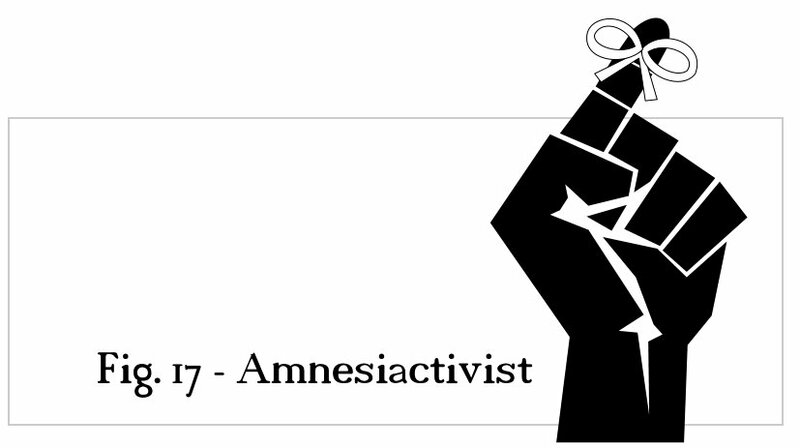 Amnesiactivist – one who can’t remember what he or she is active in, or what the big deal is.